It's been more than 500 years since Christopher Columbus sailed the ocean blue in search of a direct water route from Europe to Asia. He never did discover that passage, but he did stumble upon the Americas and kicked off centuries of exploration, and exploitation, of the western hemisphere. Columbus' legacy is mixed. He was daring and adventurous, but Columbus' exploration also led to devastating consequences for the native populations he encountered and charges of cruelty. 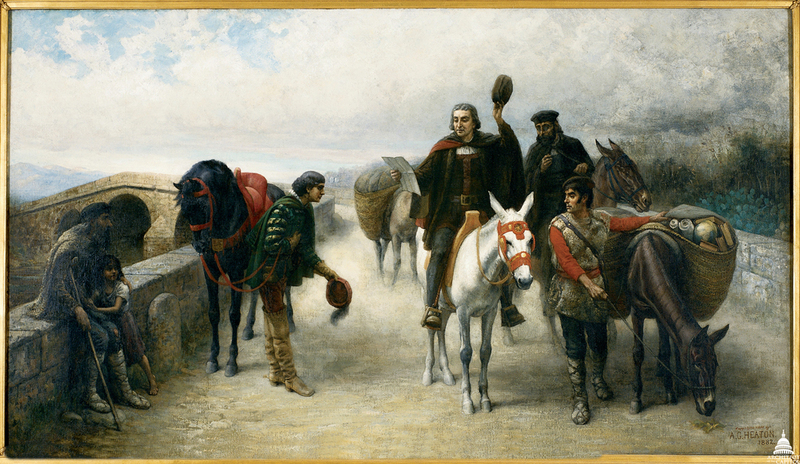 Today, we can see how Columbus' 15th century journey was later depicted by 19th century artists. Constantino Brumidi, renowned Capitol artist, painted three frescos of Columbus between 1859 and 1878: Christopher Columbus – Discovery, Columbus and the Indian Maiden and Landing of Columbus (cover photo). The Recall of Columbus by Augustus Heaton captures a significant moment in Columbus' life. In June of 1836, Congress commissioned John Vanderlyn to paint Landing of Columbus, an oil-on-canvas depicting Columbus and members of his crew on a beach in the West Indies in October 12, 1492. A sandstone relief of Columbus is also in the Rotunda and can be seen on the west wall. In 1884, the Joint Committee on the Library purchased The Recall of Columbus by Augustus Heaton. This artwork can be seen in the East Corridor of the Senate Wing of the Capitol. It portrays the moment a messenger informs Columbus of Queen Isabella's pledge of support for his exploration after earlier dismissing him from the royal court. Randolph Rogers' Columbus doors are located on the east entrance to the Rotunda. One of the more fascinating pieces of Columbus art in the Capitol is the Columbus Doors by Randolph Rogers. 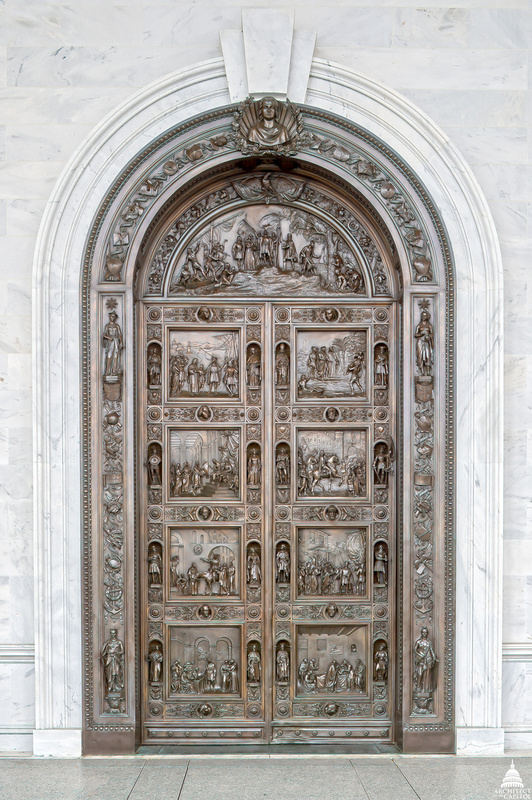 Installed in 1863, the doors include details of the life of Columbus. The left valve of the door depicts Columbus before the Council of Salamanca, his departure from the Convent of La Rabida, at the Court of Ferdinand and Isabella, and his departure from Spain. In the tympanum (between the arch and the top of the door), Rogers carves Landing of Columbus in the New World. While the right valve includes images from Columbus' first encounter with Indians and his triumphant return to Spain after his first voyage. In 1500, Columbus was arrested and returned to Spain on charges of mismanagement of Hispaniola and was stripped of his governorship. Five years later, on May 20, Columbus died. These moments in Columbus' life are immortalized in the bottom two panels, Columbus in Chains and Death of Columbus. This month, set sail on your own discovery of the artwork of the Capitol campus. Schedule a tour of the U.S. Capitol, explore Capitol art through our website or visit a local library to read about the collections that are a part of this historical building.